Rays ace Blake Snell came to terms on a five-year, $50-million deal on Thursday. The Tampa Bay Rays have reached an agreement on a five-year, $50-million contract with reigning Cy Young winner Blake Snell. There are no options included in the contract, which will buy out all of Snell’s arbitration seasons, as well as his first year of free agency. The deal also does not include a no-trade clause. The left-hander will be paid a $3-million signing bonus and earn $1-million in 2019. He’ll then be paid $7-million, $10.5-million, $12.5-million and $16-million in the subsequent four seasons. That $16-million salary in 2023 can increase by up to $2-million in incentives. Snell’s new deal is the largest contract in big league history given to a player before reaching arbitration. I’m happy to be here. I don’t want to go anywhere. I think with the deal I made with them, it’s going to keep me here longer than I would’ve [been] if I didn’t. And that makes me really happy because I’m comfortable here. I like the team we’re building. This is a great team. The new deal comes just weeks after Snell was less than pleased with the teams’ decision to give him a $15,500 raise over the preceding Cy Young Award-winning season (at a time when the league-minimum salary increased by $5,000). The Rays have the right under the collective bargaining agreement to renew me at or near the league-minimum salary. They also have the ability to more adequately compensate me, as other organizations have done with players who have similar achievements to mine. The Rays chose the former. Snell told the media he was surprised when the Rays approached him over the past couple of days with negotiations, especially since neither side had been able to come to terms on a contract extension the past couple of years. He also said he was more than willing to go through the arbitration process until the Rays met all of his requirements. They were listening, and they actually met me where I wanted to be. I said, ‘This is the only thing that’s comfortable for me to do.’ And I told them I love being here, this is where I want to be. I get one year into my free agency, which I’m happy about, and I’ll be out after my 30-year-old season, I’m happy about that. In a sense, however, Snell is betting against himself because the team had the leverage, which Lauren Theisen (Deadspin) touched on. Snell is betting against himself here, in a sense, by sacrificing money that he could have won down the road in arbitration for a solid guarantee now. But there’s more to it than that. Given the paltry contract that the Rays initially gave him, which was just about the minimum guaranteed in the league’s collective bargaining agreement, Snell had no leverage. He was still a year from arbitration, and faced with the choice between $50 million guaranteed and about $600,000 guaranteed, which would you take? Crucially, this deal also does not include a no-trade clause. Given the Rays, this means that they don’t really intend to pay out the last year or two of that heavily backloaded contract themselves. When the time is right, Snell will be flipped for the next round of leverage-less prospects, who will have no choice but to accept the next set of minimal raises. Dan Szymborski (Fangraphs) also noted that Snell is likely shortchanging himself by $23-million in a world in which the extension was not signed. Still, the deal does make sense for both sides as the Rays an extra year of control while Snell gains guaranteed money over the next five seasons. It’s the second contract extension this week for Tampa Bay, who locked up Brandon Lowe on a six-year, $24-million deal. Snell joins Lowe and Kevin Kiermaier as the only players on the 40-man roster to have guaranteed contracts past the 2020 season. However, Rays general manager Erik Neander said the possibility of more contract extensions remains. when there are opportunities that increase the chance they can be here for a long period of time – that’s something that we will continue to explore whenever those opportunities present themselves. On Wednesday, the Tampa Bay Rays officially announced a six-year, $24-million contract extension for the left-handed hitting infielder/outfielder, Brandon Lowe. The deal could top out at $49-million in total value if the two options (for 2025 and 2026) sewn into the fabric of the contract are exercised, and all incentives are reached. We believe Brandon has the potential to make a longstanding impact at the Major League level. He’s shown both an advanced feel for hitting and the ability to drive the ball to all fields, and he’s quickly becoming a versatile defender who can help us in many ways. Brandon’s development, both offensively and defensively, is a testament to his commitment to his craft, and a credit to all of our staff who have scouted, coached and worked with him. With this agreement, we’re excited to cement his place in our young core for years to come. Lowe joins Evan Longoria in 2008 (six years, $17.5-million plus three options in the first of two deals), Matt Moore in 2012 (five years, $14-million plus three options), and Chris Archer in 2014 (six years, $25.5-million, plus two options) as the fourth player with less than one year of Major League service time to sign a long-term extension with the Rays. Lowe, 24, was promoted to the big leagues on August 4 (last season) and appeared in 43 big league games. His career got off to an inauspicious start, with an 0-for-19 skid at the plate, yet Lowe finished the with a .884 OPS over his last 37 games. Overall, he hit .233 BA/.324 OBP/.450 SLG/.774 OPS with 14 extra base hits — six home runs, six doubles, two triples — and two stolen bases (in three attempts). More importantly though, as Steve Adams (MLB Trade Rumors) noted, context-neutral metrics like OPS+ (112) and wRC+ (113) felt his bat was 12 to 13 percent better than that of a league-average hitter when adjusting for league and home park. Lowe’s 25.6% strikeout rate was a bit higher than his previous work at Single-A, Double-A (in 2018), and Triple-A — which could be attributed to becoming acclimated to big league pitching — however, he showed power and drew walks at a 10.8% rate in his first crack against MLB opposition. Either way, Lowe has shown an ability to hit through Tampa Bay’s farm system, hitting 22 home runs across 100 games between Double-A Montgomery and Triple-A Durham, where he combined for a .297 BA/.391 OBP/.558 SLG/.949 OPS overall line. Lowe is widely regarded as one of Tampa Bay’s most promising prospects — Baseball America rated him as baseball’s number 93 prospect this offseason, while Fangraphs ranked him 46th overall. Adams also noted that Lowe has spent the bulk of his career as a second baseman, though he got his feet wet with more than 500 innings of work in the outfield corners last season (between the Majors and minors). Scouting reports have generally projected him as a potentially average defender at second, though he’s considered to be more of a bat-first player. There’s definitely something to be said to know what’s going to be there for the six years but it’s also, as much of a security blanket it is, that to me it is something, it’s a goal to out-perform. You see that and now I want to do better than this contract. I want to perform better so maybe they realize they got something good from it as well. A day after the Spring finale against the Twins was washed out, the Tampa Bay Rays Rays head to Fort Myers where they will face former teammate David Price and the Boston Red Sox. Tampa Bay made a series of roster moves on Saturday, most notably optioning RHP Austin Pruitt to minor league camp, and reassigning southpaws Ryan Merritt and Colin Poche — both of whom are scheduled to pitch Sunday — and infielder Nate Lowe. The plan for Lowe, who was competing for a spot on the roster big league, is to go back to Triple-A Durham, where he will begin the season, and get some reps at first base. Good impression. I told him that he’ll be the one that ultimately drives the decision. He came on so strongly last year. He did some good things. Obviously, we saw enough of the power to really appreciate how far he can hit a baseball. Asked him to go down (to Durham) and continue to work. Value his defense as much as his offense. We know once guys get up (to the Majors), that’s really important. Blake Snell was able to get in some work on the back fields on Saturday, pitching in a minor league game against the Orioles. Snell threw one inning and allowed a solo homer while striking out two before that game was called because of rain. He tossed 11 of 17 pitches for strikes (65% strike rate) before finishing his work in the batting cages. All told, Snell threw about 54 pitches and got in another 3-2/3 innings in the batting cages. I felt really good today. Really good. I’m where I need to be, if not ahead of it. Everything was great. I was very happy with everything. Snell’s last tuneup of the Spring will come Friday in Port Charlotte against the Pirates. Ryan Yarbrough (2 IP) and Yonny Chirinos (4 IP) also threw in the cage to get their work in. 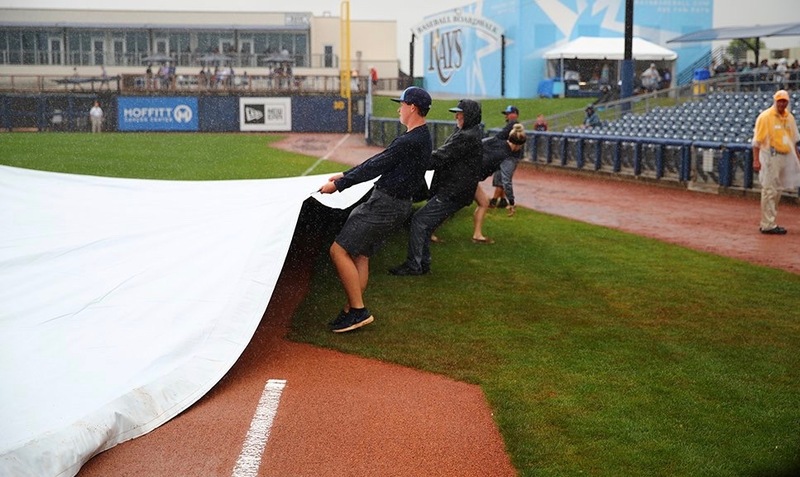 Per Neil Solondz (Rays Radio) Tampa Bay will slightly alter its position player schedule due to the rain out, but the pitching will not change much. Ryan Merritt will take the mound Sunday, pitching opposite of David Price. Colin Poche is also expected to face Boston’s right-handed dominant lineup. Looking forward to seeing Blake Snell strikeout Bryce Harper in Clearwater this afternoon. The Tampa Bay Rays optioned or reassigned eight more players on Sunday, reducing the team’s Spring Training roster to 49. Catcher Nick Ciuffo, pitchers Jake Faria and Andrew Moore, and INF/OF Andrew Velazquez were optioned to Minor League camp. Faria, who has put together a strong showing this Spring after performing to a 5.40 ERA across 65 injury marred innings last season, was the most surprising move. 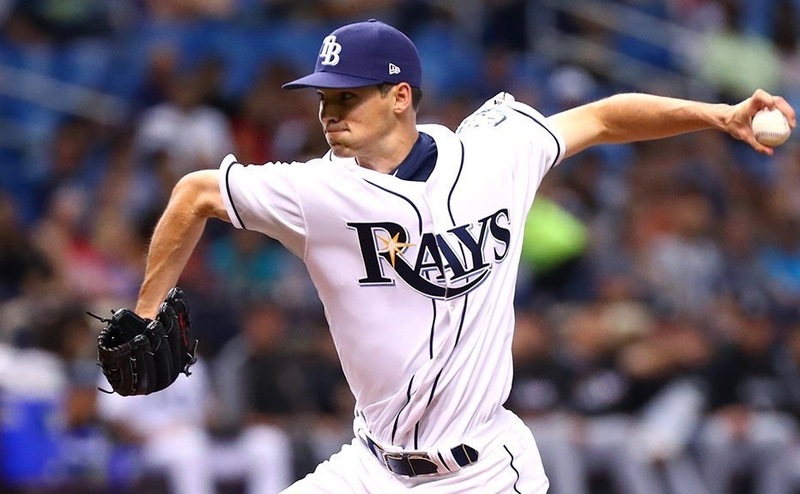 Rays Manager Kevin Cash was encouraged by what he saw out of the right-hander, however, he explained to Faria that optioning him to AAA would give him the opportunity to be stretched out further. It’s time for him to get on a routine; it’s not the easiest thing to do the routine here. And get him stretched out. The message was very similar to the message when he came in (to camp): how highly we think of him, what he’s capable of. We want to do everything we can to assist him (in) getting back to that 2017 form. It’s going to take some time, but he did he did show really well for us in spring training, which was encouraging. Faria, who had been optimistic about breaking camp with the team, told Marc Topkin (Tampa Bay Times) Sunday morning that he would be disappointed by such a move, however, he acknowledged that he knows he will eventually return as long as he respects the process. Obviously I’d be disappointed just because you spend almost two years in the big leagues and then you go back to Triple A, but guys have done it. I’d still have a job, so that’s one thing. We’ll have to see. I’d be kind of bummed out. … But I know if I keep doing what I’m doing I’ll be back eventually. Four non-rostered players were also reassigned to the Minor Leagues, pitchers Ian Gardeck and Tyler Cloyd, infielder Jake Cronenworth, and IF/OF Nick Solak. Cloyd is the lone player of the bunch with big league experience. In Grapefruit League action, Tampa Bay homered six times, including a tape-measure blast from Avisail Garcia, and two from Guillermo Heredia, in the 8-1 win over the reigning World Series champions. Tampa Bay has won both meetings against Boston this Spring. Garcia’s homer off Hector Velazquez had a distance at 464 feet according to Trackman data. The homer was also measured at 111 mph off the bat, and at a 35-degree launch angle. Garcia, who is coming off knee surgery, said he feels good thus far. I’ve been feeling great, working really hard, My knee is healthy, that’s the most important thing. I’ve just got to keep working, and do my thing. It was a hard off-season, trying to rehab and get better every day. Coming in like this, how I feel right now, it’s amazing. Casey Sadler opened the game and was followed by seven other pitchers — including Colin Poche, Diego Castillo, Jose Alvarado, and Ryne Stanek — that allowed just five hits. In spite of a difficult Spring for Poche, the southpaw showed well after he allowed a leadoff walk, coaxing a double-play grounder and a fly-ball out. Tampa Bay will open a two-day north Pinellas County trek today in Clearwater, where they will face the $330-million man Bryce Harper and the Philadelphia Phillies. Rays Cy Young award winner Blake Snell will get the start for the Rays. Yonny Chirinos, Jalen Beeks, and Wilmer Font — three candidates for long relief/bulk inning jobs — are also scheduled to pitch. — Cash told the media Sunday there was no update on third baseman Matt Duffy (hamstring), except that he will be out at least a few more days. — Per Topkin, Tommy Pham, who was planning for a week of DH-only duty to work on strengthening his shoulder, was scratched from Sunday’s lineup but said he plans to be back Tuesday. Cash said the shoulder “is not bouncing back maybe like he wanted it to” and will take “two days off of nothing.” Pham said he expects to be back in the outfield by the end of the week.